The soul is the consciousness or the awareness principle in man. The mind fits to the group of substance. 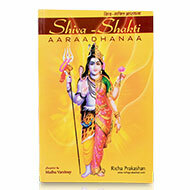 Hence Shiva is the soul and Parvati the mind. Consciousness is Reality, the unchanging, unmoving, all-encompassing soul. The mind being a matter is changeable and is unreal. We identify matter through perception. The soul allows organs to distinguish the objects. Soul exists in all beings as consciousness. It is the soul and its light that makes the sense-organs and the mind seem alive and radiant. Shiva is the never-changing consciousness. 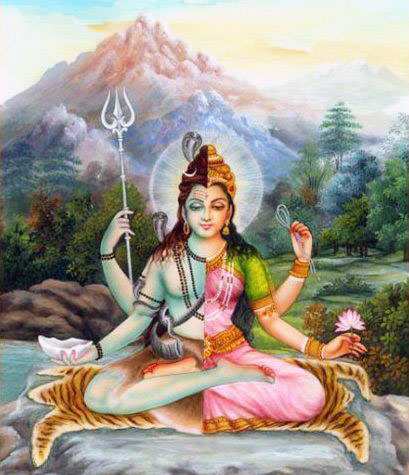 Nirguna or without form or shape, this unchanging consciousness-Shiva grows into Saguna or with form, when Maya Shakti (Shiva's illusive power) appears as mind and matter. This phenomenon is known as Ardhanarishwar. Shiva's Maya-Shakti is called various names such as Uma, Parvati, Kali, Durga etc. This Maya-Shakti or power inheres in Shiva just as the burning power exists in fire, sweetness in sugar, whiteness in milk and meaning in the words. Shiva symbolizes Absolute, the never-changing, static background, of which Kali, the Shakti (power) is the energetic expression. We call this Shakti, Mother or Goddess. Goddess Kali encompasses creative dynamism, destructive terror and emancipating grace. The trident or Trishul of Shiva (the three pointed javelin like weapon) denotes the three gunas, namely Sattwa, Rajas as well as Tamas. The Trishul is the insignia of sovereignty. Lord Siva brandishes the world through these gunas. Siva is Trilochana, the three- eyed one, with the third eye located in the forehead, and is known as the eye of wisdom (gnana-chakshu). The burning power of the wisdom of the third eye ends desires for worldly substances and leads to transcendental vision of the Supreme Reality.